The latest cookbook from "Pioneer Woman" author Ree Drummond - filled with delicious recipes and simple how-to instructions & photography. A "can't put it down" best seller! 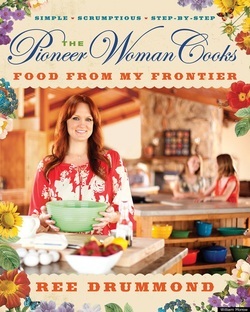 We also carry Ree's book, "Pioneer Woman - from Black Heels to Tractor Wheels" - a fascinating account of her life as a ranch wife & mother, best-selling author & blogger & TV personality. Uncle Ricky's has just received several new book titles - great for gifts or spoiling yourself. Just arrived - both of Diners, Drive-ins & Dives Cook Books from Guy Fieri! Ever send a text message that didn't turn out exactly as you wanted...Grrr, Autocorrect! 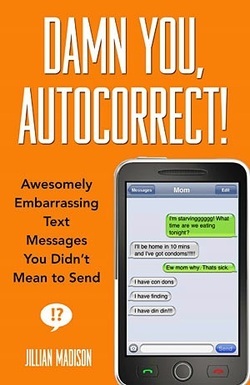 This hilarious book is filled with examples of "messages gone wrong" when Autocorrect takes charge. Great gift for your cell phone addict! Great advice from Father Pat Connor on "weeding out the bad seeds" so finding the perfect match has better odds. A heavenly-how-not-to, Whom Not to Marry offers timely and time-honored advice for those playing the dating game. How to Booze has all the answers on what to drink when. Armed with nearly one hundred iconic recipes, useful facts on technique and ingredients, and more than enough advice to get you into trouble, you will now know just the right drink for the occasion—and how to prepare it like a professional. OK, so we didn't have access to this when raising our perfect child :) But Raising the Perfect Child Through Guilt and Manipulation is written by stand-up comedian Elizabeth Beckwith with a sense of humor and great tips on guiding little kids into great human beings. Just in time for Springtime gift giving - Michel Design Works was a tremendous hit during the holidays at Uncle Ricky's and the Springtime collections are on their way! These beautiful soaps, kitchen towels, wooden trays and home accents have fantastic fragrances, and are gorgeous to boot! Choose from Lemon Basil, Lavender Rosemary, Hyacinth Iris, Sunflower, Provence, Gardenia, Beach and Lapin.